World class facilities are rewriting the training manual for graduates and apprentices entering the nuclear industry in the South West of England as the sector experiences unprecedented growth. Statistics from the Nuclear Skills Strategy Group say approximately 13,000 skilled people are required in the region to meet the sector’s skills demand between 2016 and 2023. The region has 29 colleges, seven universities and a significant number of high-quality independent training providers with a growing mix of options to provide the skilled workforce and capacity that the industry needs. These facilities together are set to deliver training for more than 7,000 people by 2020. They include the flagship Southern hub of the National College for Nuclear located in Somerset, which aims to enrol 400 nuclear apprentices by 2023. The £15m facility located at Bridgwater & Taunton College (Cannington Campus) is a partnership between industry, national regulators, skills bodies and training providers which is set to revolutionise the way that training for the nuclear sector is delivered. “The South West’s nuclear sector is experiencing unprecedented growth. The region has the highest density of nuclear sites in the UK and is at the forefront of research and skill building,” said Matt Burley, chair of Nuclear South West. “The nuclear industry is the engine of the South West economy and provides opportunities for people and business to develop hugely rewarding careers in the region. Since the National College for Nuclear, Southern Hub opened in March, more than 300 students have enrolled. It offers specially designed infrastructure and equipment to ensure high-level technical training, create a pool of job ready candidates and support economic growth. Working closely with the industry, the college has just launched a new Digital Engineering Apprenticeship, which offers training in digital prototyping technology, with a focus on the data associated with a building’s design, construction and operation. Paul Goss, Head of the National College for Nuclear, Southern Hub, added: “The nuclear skills and training offer in the South West of England is better than ever before. Through innovation and collaboration with industry, we offer a wide range of courses to support the training and skills delivery for the nuclear sector. There are more than 12,500 jobs across the UK civil nuclear supply chain in the South West region, covering expertise including power station operators, new build vendors and developers, those engaged in decommissioning, waste management and the nuclear fuel cycle. 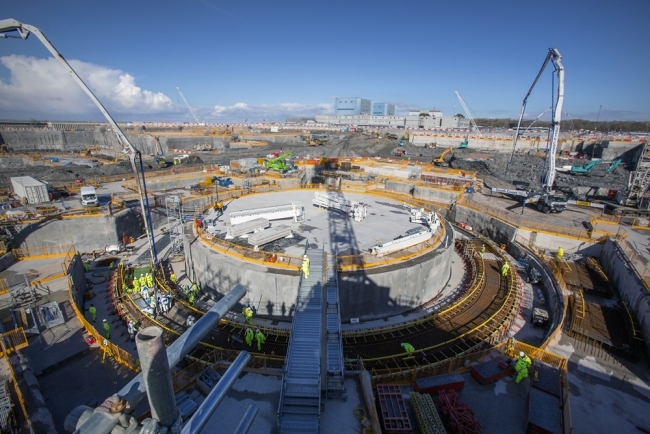 This is set to rise with the completion of Hinkley Point C Power Station. Europe’s largest construction project will be run by a workforce of around 1,000 people throughout its 60-year operation. The Construction Skills and Innovation Centre at Bridgwater & Taunton College in Cannington, Somerset (UK) replicates a real-life construction site and aims to deliver skills that are highly sought after for the construction of nearby Hinkley Point C.
“The Construction Skills and Innovation Centre is pivotal in delivering infrastructure construction trade apprenticeships and training, to upskill the existing construction workforce and bring new entrants into the construction sector,” said Simon Brewer, the centre’s Head of Civil Engineering. “Our programmes have been developed with client and contractors involved in the new nuclear build at Hinkley Point C to ensure they meet the specific demands of such a highly regulated construction environment.